Check out and print our new ‘How to Create A Bee Friendly Garden’ Flyer. It has lots of simple ideas on how to be Bee Friendly! Plant heirloom varieties of herbs and perennials as hybridisation has reduced the nectar and pollen in many flowers. Plant flowers in clumps of up to 1 metre across as it is easier for pollinators to find and reduces foraging distance. Choose several colours of flowers. 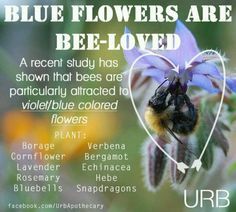 Bees have good colour vision and are particularly attracted to blue, violet, purple, yellow and white. They like petals with nectar guides including stripes and spots. Native bees prefer a variety of ‘local’ native They are largely ground dwelling and prefer soil free of pesticides and fertilizers. Leave areas of the ground undisturbed for native bee nesting sites. Keep dead wood and trees in paddocks for habitat. Butterflies prefer red, orange, pink and white flowers with a trumpet shape that hold nectar. Provide a wide variety of plants that flower throughout the year. Some species of grevillea and callistemon will often flower twice a year. Plant in sunny spots with some shelter from strong winds. Use organic seeds and seedlings to ensure plants have not been treated with pesticides. For suppliers please go to Organic Suppliers section. Don’t use ‘-cides’ in your garden (pesticides, herbicides, insecticides). Ask before you buy plants what chemical treatments have been used on seedlings. Look up our Be Bee Friendly flyer for other common brand names of neonicotinoid pesticides. Share with your local nursery information about the dangers to bees of these pesticides and support smaller nurseries which have a better connection with their suppliers. 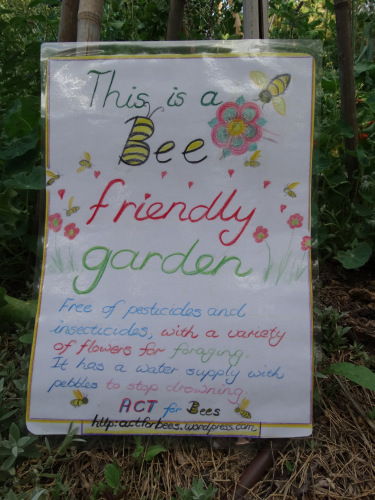 Create BeeFriendly Garden signs for your front garden to advertise what a Bee Friendly garden is. Bees and other beneficial insects — ladybugs, butterflies, and predatory wasps — all need fresh water to drink. Put stones in a bird bath so they don’t drown. Herbs are the bees medicine chest and great for cooking so include a wide range of herbs in pots or in the garden. Basil, Bee Balm, Calendula, Chamomile, Coriander, Dill, Echinacea, Lavender, Lemon balm, Oregano, Peppermint, Rosemary, Sage, Sunflowers, Thyme and Yarrow are wonderful additions to our gardens and can be grown in pots if limited space. Good for us and good for bees, butterflies. Let them go to flower! Planting & Creating Habitat To Attract Bees Great resource from Valley Bees community in Nth NSW with lots of ideas for bee hotels as well asthe plants that flower in different seasons. Download the Bee Friendly: A Planting Guide for European Honeybees and Australian Pollinators by Mark Leech. An excellent resource for all gardens. Try garlic spray for aphids instead of pesticides. Learn about companion planting where particular plants grown together flourish and are stronger. Natural Pest & Weed Control shows how to encourage pest predators in your garden. Integrated Pest Management is a great guide by Canberra Organic Growers Group about how to manage pests & diseases using a range of strategies.